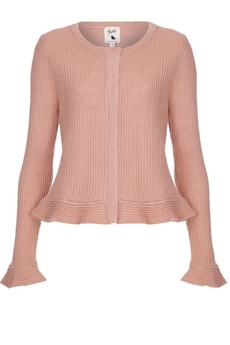 Yumi London Peplum Cuff and Hem cardigan is perfect for layering for a day-to-night look. In pretty vintage blush-rose color, made from soft-in-touch knit, has frill hemline detail and concealed snap-fasteners at the front. Is approx. 55cm in length. Winter collection. Composition: 100% Acrylic. Color: Salmon.